Australia is the world's seventh-largest domestic market and arguably has been one of the plushest with the most handsome yields. Recently large additions of capacity from Qantas and Virgin Australia have shredded profitability by hundreds of millions of dollars. There is much debate about the Qantas Group's 65% market share "line in the sand" that sees them add capacity to match Virgin. Overlooked in this debate is where the capacity is being added and why it is so difficult to absorb it. This report looks at the growth in the domestic market over the past two years, when this battle has been at its most intense. The fastest growing market has been the segment within Western Australia, with nearly 40% growth. This capacity is tied to mining work, which has recently softened. This market typically has very limited (if any) leisure focus, so it is difficult to stimulate demand with reduced fares and profits. There has also been rapid capacity expansion on east-west coast routes, markets which are also challenging to stimulate. The issue for Qantas and Virgin now is not only to address the capacity situation at large, but also their strategy for Western Australia, where one-third of all Australian airline capacity goes to or from. The largest markets in Australia based on ASKs from the six months ending 30-Mar-2014 and 30-Mar-2012 are fundamentally unchanged. Victoria-Queensland and New South Wales-Queensland are the largest and second-largest markets respectively. But elsewhere there have been changes, reflecting the restructuring in Australian domestic aviation as Virgin Australia has stepped up to challenge its much larger competitor. The intra-Queensland market has moved up two ranks to being Australia's third-largest market. This is partially driven by Virgin Australia's entry into regional Queensland markets with ATRs. The Victoria-Western Australia market moved up one rank while New South Wales-Western Australia dropped by three ranks. NSW-WA is partially distorted by the 2012 period being when Qantas deployed 747-400s on the Sydney-Perth route as a response to Virgin Australia's widebody entry on the market. 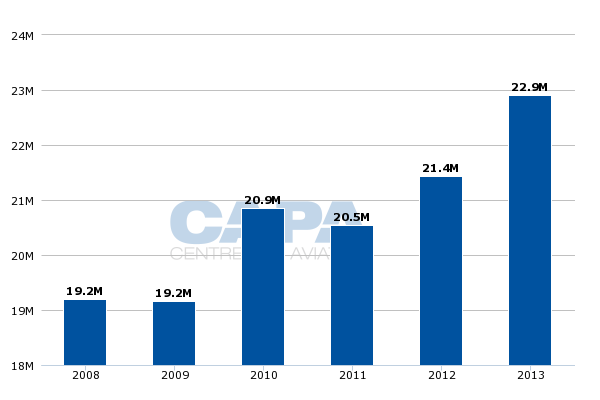 The 747s were not used during the 2014 period. While the Melbourne-Sydney-Brisbane "triangle" may be the core of Australian aviation for many, Qantas and Virgin's capacity in recent years has largely involved the other side of the country. It is there that capacity within Western Australia grew almost 40% over a mere two years. Strong growth has also come on east-west coast routes from Western Australia to Victoria and Queensland (to New South Wales there were actually declines). The growth within Western Australia has largely been fuelled by a boom in mining that not only captivated the state but largely propped up the Australian economy while much of the rest of the world was suffering recession; fast growth in Western Australia made up for some contractions in eastern states. While it may seem surprising such large growth could occur, Perth-Karratha and Perth-Port Hedland (the two largest intra-state routes) are at least 75% longer than Melbourne-Sydney, Australia's largest domestic route and one of the world's most trafficked city-pairs. This capacity is scheduled only and excludes the large charter business, which Qantas and Virgin Australia eventually got into with their respective acquisitions of Network Aviation and Skywest. The economic growth in Western Australia relied on support from companies in eastern states, fuelling growth on the "east-west" corridor from Western Australia to eastern states. Capacity was also used for mining companies whose employees commuted between the east coast and Western Australia. And finally, capacity was a reprieve to the leisure market that endured years of high air fares even when LCCs were large around the eastern coast. What these percentages do not show is the absolute level of production, or capacity, that was added to the markets. Bringing these numbers into focus, the extreme growth of Western Australia becomes apparent. 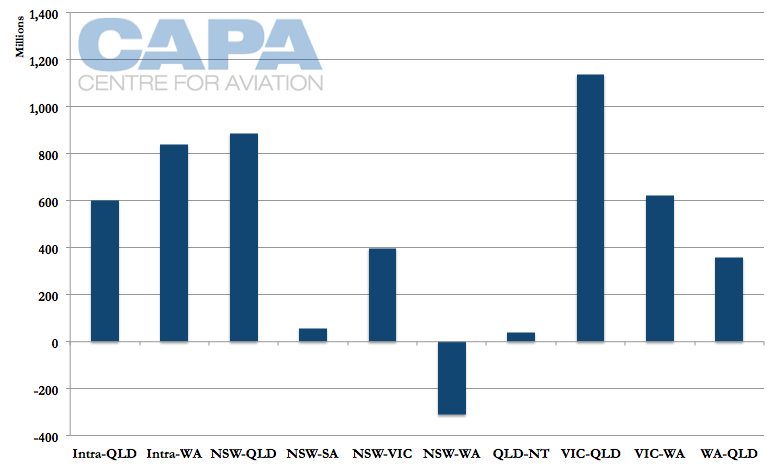 The intra-WA market saw twice as many ASKs added as between New South Wales and Victoria, home to Australia's two largest cities and largest domestic air route. 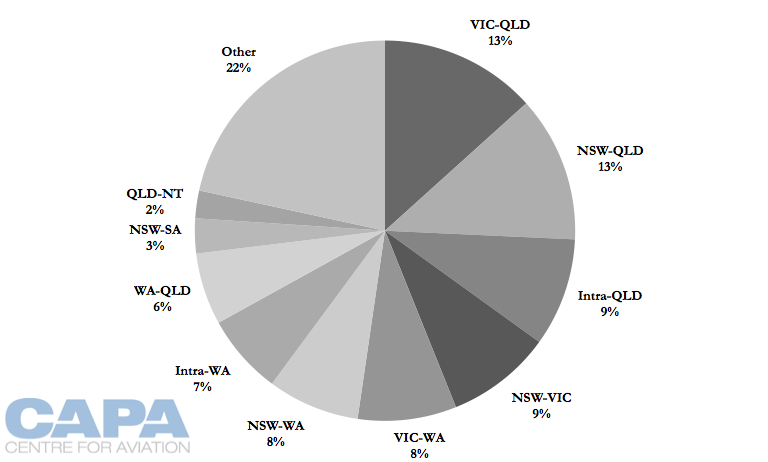 Intra-WA saw more ASKs added than intra-Queensland despite WA having a population of 2.5 million, significantly less than Queensland's 4.6 million. The WA growth is testament to the reliance of mining, and its large transient population, on the aviation sector in Western Australia. The two are inseparable, for better or for worse. Large growth in capacity to or within Western Australia consequently impacts the entire domestic market. 32%, or one-third, of ASKs in the domestic Australian market are on flights to, from or within Western Australia. With such a large proportion of capacity bet on a flourishing mining boom, any sneeze in that market meant the rest of the domestic market would catch a cold. Qantas' severely depressed 1HFY2014 domestic profit and Virgin Australia's 1HFY2014 loss were results of excess capacity that could not be absorbed. The largest absolute increase in ASKs has been between Queensland and Victoria. Demand can be stimulated as the two states are populous and there is leisure demand. However, east-west coast traffic is difficult to stimulate. The reason is that it is substantially dedicated towards the corporate market, which is less susceptible to stimulation as it generally travels based on need and pays the fare in the market; reduced fares are unlikely to stimulate an increase in meetings. The leisure potential of the market has been discouraging. Western Australia has a smaller population, reducing the potential pool of leisure travellers compared to the Queensland-Victoria market. The bigger sights and activities that would likely stimulate traffic are arguably concentrated on Australia's east coast. The east however is also home to a larger population, meaning potential inbound visitors are coming from a small source market. The ideal situation is the reverse where the large population pool goes to where interest is: Chinese visitors to Australia, for example. And then there is the cost consideration. The high cost nature of Australian airlines means flying them for four or five hours, as east-west routes are, requires a price point that can be higher than levels foreign low-cost airlines charge to bring passengers to a destination in Asia that seems more exotic, diverse, cheaper and in close proximity to another equally different location. Domestic tourism's challenge is not competition within the sector but competition from Bali, Kuala Lumpur, Phuket and a number of other cities. Qantas and Virgin may embark on cost-reduction programmes, but their Asian competitors will become more efficient – and the real concern, more numerous. A look at load factors aggregated across all operators reflects many of the themes of this over-capacity situation. These load factors are for the full year to Dec-2013 (latest data available from BITRE). Perth to Karratha and Port Hedland saw 5-8ppt drops in load factors, which were already low (but fares are typically high-yielding). The east-west markets of Brisbane and Melbourne to Perth saw declining load factors, in line with the capacity expansion. Although data are not available, fares are known to have reduced drastically in these markets. The Perth-Sydney load factor has improved by 3.5ppt, but this was a result of capacity being taken out of the market – an indication of what further corrective measures are needed in the Australian market. The "Triangle" routes showed decreases in load factors, but the more leisure-focussed Gold Coast-Melbourne market experienced an improvement in load factor, likely as reduced yields stimulated demand. This is unlike Gold Coast-Sydney, where load factors decreased, in line likely with Qantas' re-entry in the market; Qantas does not serve Gold Coast-Melbourne. 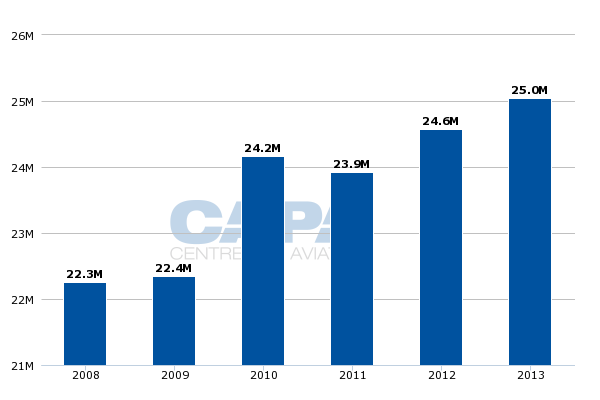 If there is a positive aspect of the weak or negative performance at the airlines, it is that Australia's airports are hitting record traffic levels, both domestically and internationally. 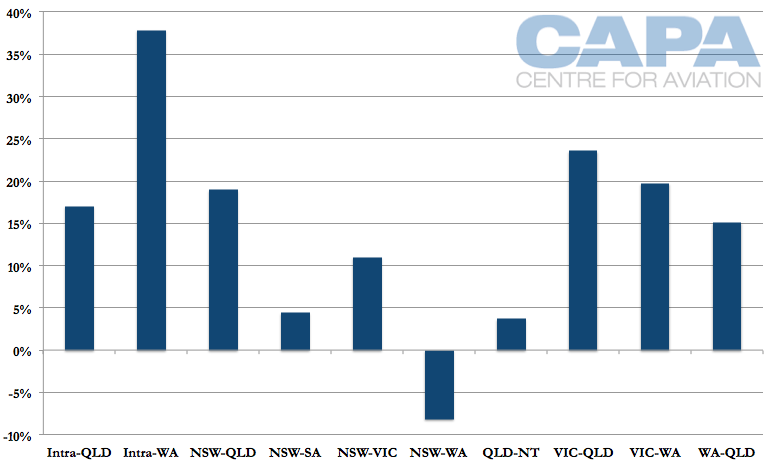 The spread is not even, and particularly strong performers are Melbourne and Perth. Melbourne has gained from a resurgent Tigerair, which has made capacity growth commitments, although Tigerair is opening bases outside of Melbourne. 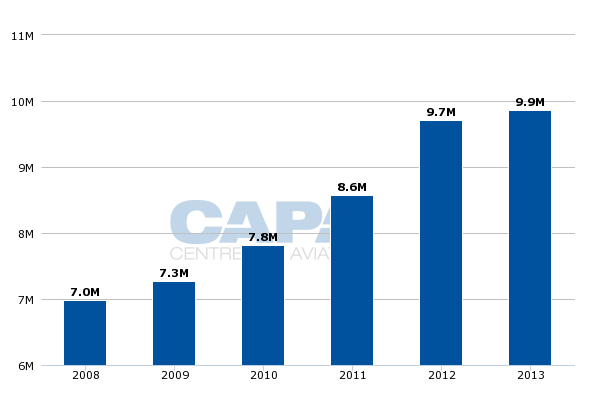 And Perth of course is at the centre of Australian aviation's capacity drive. Outlook: capacity must be reduced. But who will blink? For the airlines, with highly perishable products, the basics apply: over-capacity generates reduced load factors (and yields). The clearest example in this battle is that the Perth-Sydney market has shown that reducing capacity improves the situation. Qantas faces the dilemma that any company experiences in similar circumstances: to cede market share or to hold the line as a new aspirant pushes the limits. In a confined zone like Australia's domestic aviation, acquiring and retaining market share has undoubted financial implications. Whether the "S curve" premium can still be extracted is more complex. And where the market is as dynamic as Australia's otherwise mature scene is, other questions have to be confronted – notably the price of retaining that market share. Over-capacity has undoubtedly led to severe discounting, notably in the previously price-insensitive corporate market, reflected in the yield falls experienced by both airlines. For Virgin too, the answer is not clear cut. Where both airlines are losing money (although Qantas is still above the line, despite a dramatic fall in profit), how long can losses be borne? Virgin can perhaps argue for a while longer that it is still on a voyage of discovery and needs to make further inroads; it also has the great advantage of some very powerful equity partners. Although the spotlight has recently been on those partners' willingness to support Virgin financially, the reality is that they are most valuable in providing it with a powerful international network – without capital cost and without the massive distractions that accompany Qantas' international operation. For now the partners seem to be deriving value from their investment, albeit not in the share price. That will not continue indefinitely, but there is undoubtedly still a decent amount of oxygen remaining. For Qantas, there are already hints it is moving away from the 65% market share dogma to talking about a "premium proposition"; it is unclear if a "premium proposition" can allow it to achieve its objective while moving away from the contested 65% market share rule. That is a theme for the market to test. Otherwise, Virgin and friends may need to show signs of tempering its appetite for growth in order to address this over-capacity situation. Neither will want to fall, whether graciously or not; there is a great deal of "face" in this contest too. Meanwhile, consumers, airports and the tourism industry are the major beneficiaries. 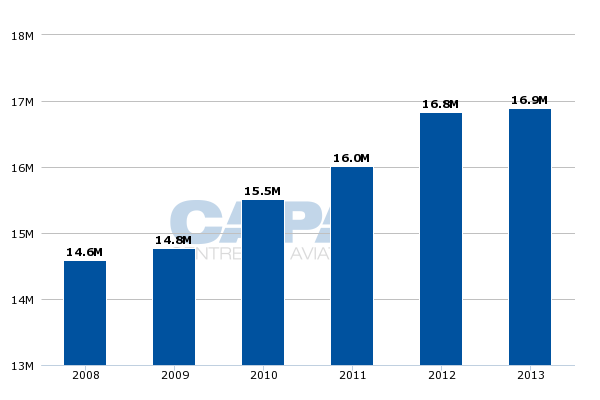 Airlines, as is so often the case, are once again the poorest part of the value chain.